Okay! 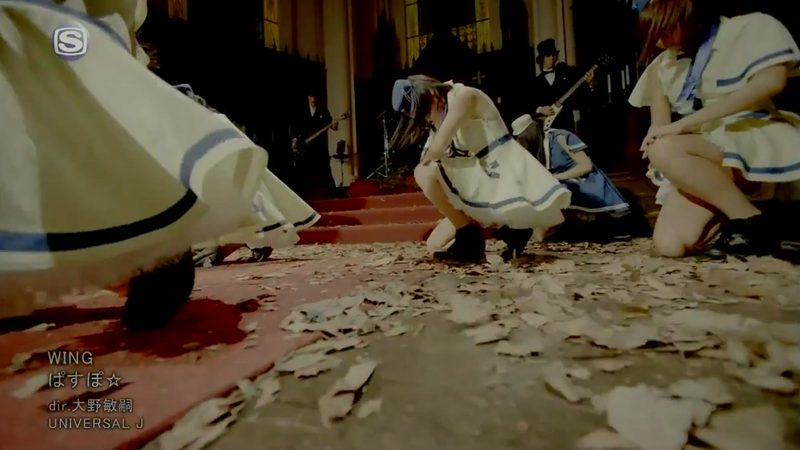 Musume Time: Vampire Nuns Attack! 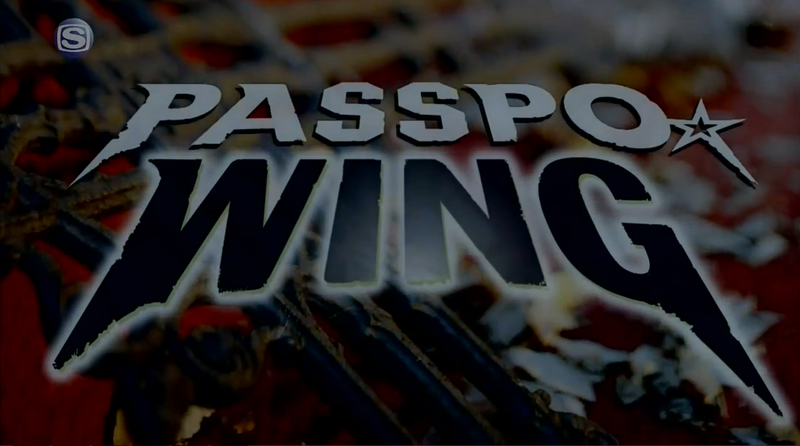 in PASSPO☆'s 'WING' PV! All thoughts and opinions within this blog are entirely my own and no one else's. If you do not like my opinion, then I don't really care, but do not try to change other people's opinions. It is A) Unfair and B) We have a freedom of choice. YES, some people like myself are opinionated, but there is nothing uglier than someone who is close minded and does not regard another's opinions. Are you ready to turn for PASSPO☆? Welcome back to the Halloween Madness! 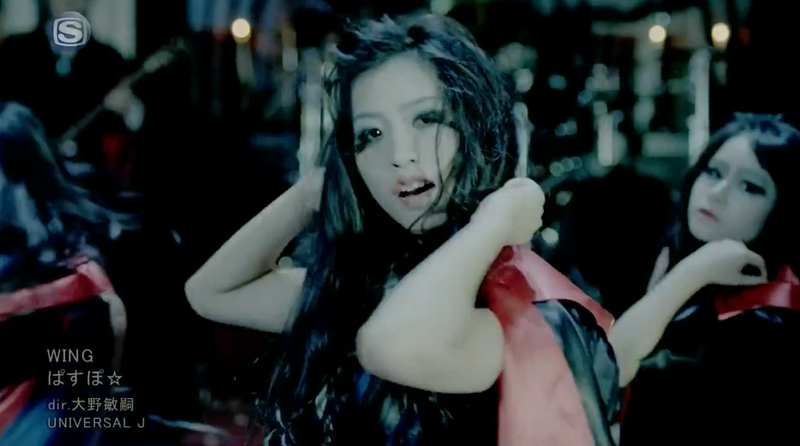 Are you ready to be bitten and changed into a Vampire with PASSPO☆? Okay, so this review has been a long time coming, but I wanted to wait for Halloween to creep up on all of us before I officially broke out this PV for a review. I've listened to the song quite a lot since then, and when I first saw the PV preview, I was really excited for what PASSPO☆ would bring to the plate, though initially I was worried that I wouldn't like it. I mean, I adored Next Flight, but Natsuzora Hanabi did nothing for me, so WING was questionable for how it would suit my tastes. Thank goodness both the song and PV satisfied me, or I wouldn't be here reviewing it now for the on-coming Halloween Madness. Which, by the way, is basically me reviewing Halloween based PV's, or PV's which I magically claim to be Halloween-like (Kitagawa Kenji being the Halloween candy theme XD). So yeah, look forward to that, because there are quite a few Halloween inspired PV's this year which really makes me happy! 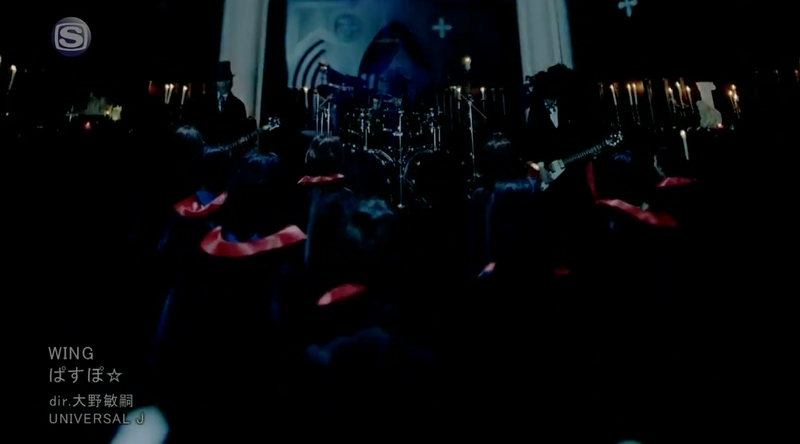 I'm going off track... oh well, let's Wing it and get into this PV Pic spam!!! This reminds me of really old Rock Groups and the openings to their music videos... the font, I mean, not the video. Already getting out the bat wings, I see. ... Oh, and nice camera positioning. ... Wait, have I joined the Nunnery without even knowing it? I don't wanna be a nun!!! ... Okay, if it means that I can stand next to Ai and breathe the same air as her, then I'll do it!!! Nun's aren't supposed to be flirtatious! Sinner, SINNER!!! These secrets shall never leave the confessional, I swear. CRAP! 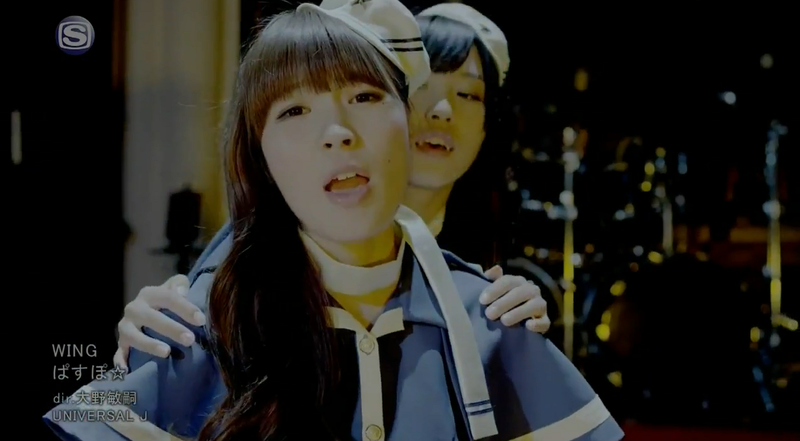 MioMio, get out of the way, there's a Vampire! Run, girl, RUN FOR YO LIFE!!! Okay, FINE, don't listen to me. See what happened? You turned into a vampire, and now you're going all Yuri on Ai and appealing to the Wota. Tch. ... Oh yeah, fan service ftw. Morishi seems to be appealing to me more and more lately, annoyingly enough. ... I have no idea why it is annoying. That face looks seriously shocked. Naomi is looking sexier, and dem lips! Anna: "Om nom nom nom nom..."
I have to say, this screen cap looks pretty cool, but what is on the side of her mouth? It certainly isn't blood. Going all Bram Stoker on us now, are we? 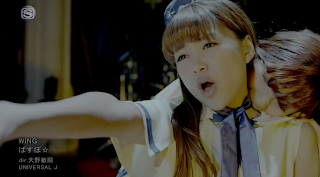 PASSPO☆ have never looked so badass... Neither has MioMio. ... That should be a movie title for some B rated horror flick. Nun love! 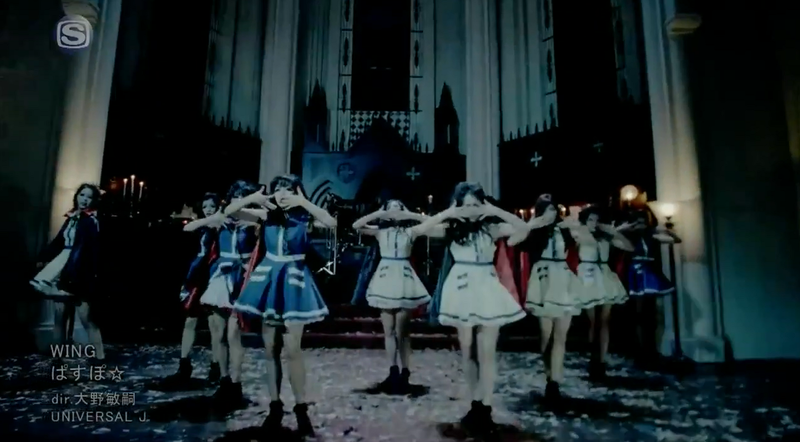 Nothing like some cute Shoujo love in a Vampire PV! MioMio: "Save us all!!! We don't want to be sparkly Vampires!!!" Sorry MioMio, I'm too busy to save you all from your Vampire fate. Hit it girl! You take that note and make it yours! Watch out! The Vampires will take flight tonight, so don't forget your night lights to keep them at bay! So, I don't know about you guys, but I really like this song and video. Okay, it isn't a patch on the glorious Next Flight, but it doesn't bore me to tears like Kimi wa Boku... did. The PV, though, is what really made me fall in love with WING. 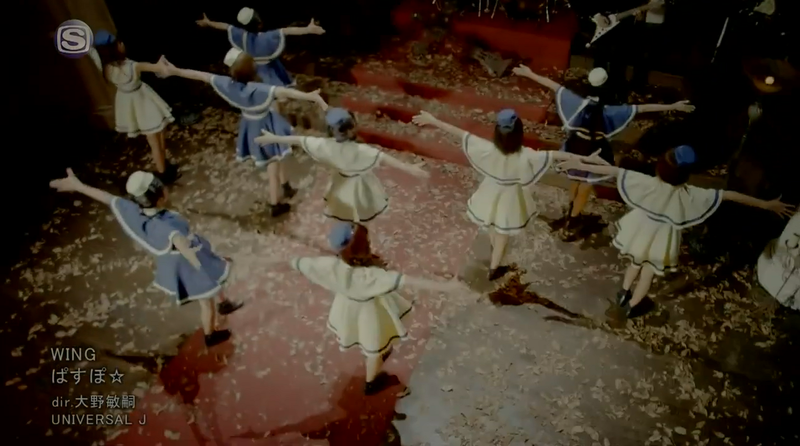 I wasn't expecting such a visually appealing piece, nor was I expecting vampires, but it's great that PASSPO☆ took on a new theme away from their flight attendant image and showed us something different, something close to flying, but quite eerie and horror-esque too without tarnishing their original theme that they go by as a group. WING as a song is a great rock-based tune which really allows the vocals from the group to shine with great solo's and group parts, allowing the stronger vocals to truly shine here. It's pretty fast paced and an all around great song to listen to if you want something different from your everyday Idol pop. Okay, so it isn't as pleasing to the ears as Next Flight is for me, but I really enjoy the sound of WING. The composition is great, and the sound of the song fits the image of the video, allowing us to enjoy a rather mature song from PASSPO☆ which can be both eerie and energetic in its own way. My main issue with the song at first though was that it used auto-tune, which actually killed the song a little bit for me for a good while. Auto-tune has been around a lot lately, and groups that I love continuously use it now to the point where I just can't believe that it's become such a big thing in Japan. Okay, I love this song now and the auto-tune isn't an issue any more - in fact, it works in the parts that it has been used, but auto-tune as a whole has become something which I dread to hear in up-coming songs from the groups that I avidly listen to. I blame Morning Musume, I really do - they did it with One Two Three, and now it has creeped into every other Idol group known to exist. Urgh, I hate auto-tune... but thank goodness it works for this song when it is used. It isn't used to the point where it sounds messy, so thank the stars that whoever edits PASSPO☆'s mucis knows what they are doing. So, the song's great, and the PV is just as wonderful. This video is a lot more gothic and darker than I ever expected it to be. The preview had me excited, but the entire PV itself is even better in my opinion. The girls start off with an innocent air around them, before being turned into Vampires by the band members. Wow! Other than simply showing the band playing behind them like they did in Next Flight, there is more of a purpose for these band members! It was great to see that little bit of interaction between PASSPO☆ and the band who were playing for them, before MioMio set off to bite everyone else and turn her friends in vampires. 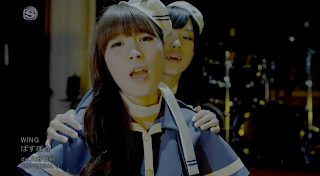 It was surprising, but I really enjoyed how PASSPO☆ took on a new identity as both innocent girls and rather sensual vampires. There really is no plot to this video, other than a lot of Vampire based fanservice as the girls bite each other on different parts of their friends' bodies. One of the more interesting aspects of the girls biting each other though was how the girls continued to sing even when they were being bitten. It made the video look more realistic (or as realistic as vampires can be) in terms of how it was executed, as if the Idols were actually turning into Vampire's during filming. I also found the lighting and the contrasting themes of the girls (Nuns vs Vampires) to be interesting in this video. 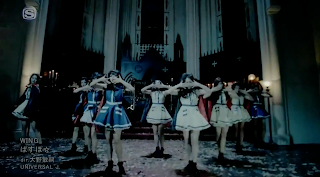 It was nice to see a pure and innocent side to the girls, whilst also seeing their dark and mature sides come to life as newborn vampires, and add that with the great lighting-like effect that went on through the video, you get a great Gothic setting in an eerie cathedral. 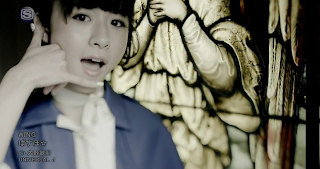 Most of my interest in this PV lies in the camera work, though. We have a lot of movement in this video, creating a rather rushed and eerie feeling with the shaking camera movements and the different shots which allowed us to view the girls from different angles, whether they are low or high or panning away. It really kept my interest and allowed me to enjoy how dark and effective this PV was with all of these wonderful camera angles and movements. It looks rushed, as if the camera work is haphazard and in need of calming down. If anything, I feel like the camera work really made this video great. It allowed me to feel the rush of the video and the desperation of the girls as they tried to fight off becoming vampires and calling for help. Forget facial expressions, Camera work won this video for me guys. This is an absolutely beautiful video. The location, visuals and camera work are all amazing and really lend to the song. 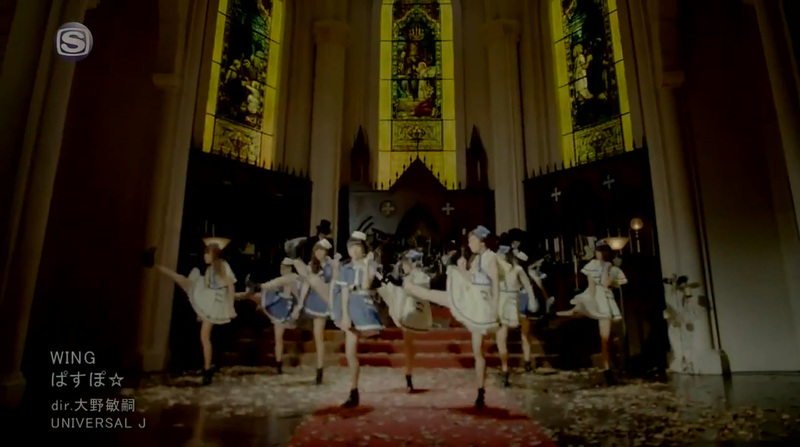 It's beautifully gothic and eerie, and allows us to appreciate this dark, sexier side to the PASSPO☆ girls. It's a great edition to the PASSPO☆ discography, and really lends to the theme of Halloween with the use of Vampires and changing each other throughout the video. The girls all look amazing in this, and the song itself sounds absolutely beautiful. 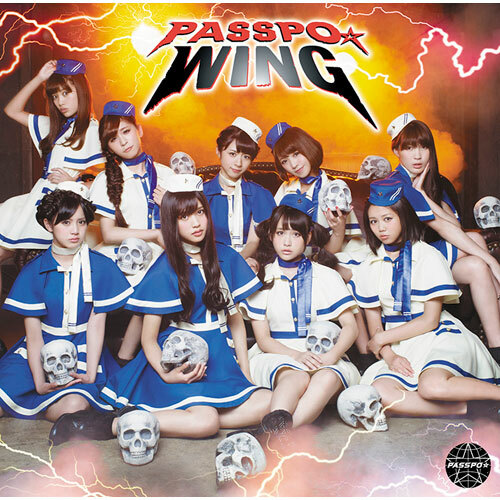 This will certainly become one of my favourite PASSPO☆ songs alongside Next Flight. It's great, I really enjoy it and I like that PASSPO☆ tried something different with their 'flight' theme and indulged in the Vampire boom that Japan has been going through lately. 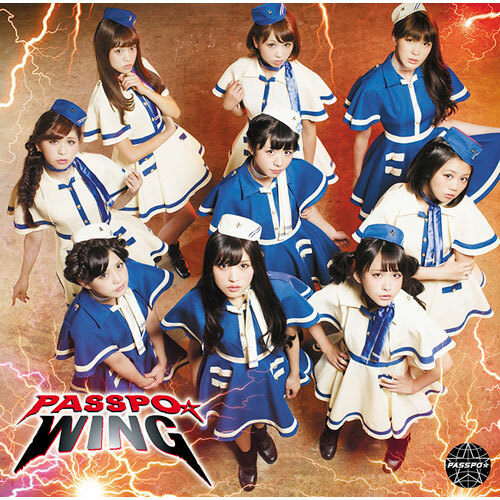 Will you take flight and join PASSPO☆ on their conquest to turn humans into Vampires?